Super comfortable bright blue short sleeved shirt with a mandarin collar and hidden button closure and shortvsleeves, box pleat at the back. Model wears a size 36. Beautiful check wool blend shirt with a front pocket, a mandarin collar and hidden button closure and long, rolled sleeves, box pleat at the back. Slit front neck. model wears a size 36. Beautiful electric blue 100% silk skirt with side pockets and partly elastic waist, very comfortable and perfect for all year round. The length of the skirt is just over the knee, 70 cm for a size 36. 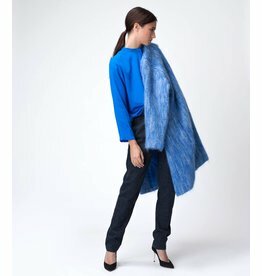 Oversized fuzzy bright blue melange mohair coat, made from the finest scottish brushed mohair, handbrushed with thistles.The coat has a round neckline, long dolman sleeves. Side seam pockets and is fully lined, closes with press studs. Beautiful navy cotton shirt with a front pocket, a mandarin collar and hidden button closure and long, rolled sleeves, box pleat at the back. Slit front neck. model wears a size 36. Beautiful electric blue 100% silk shirt with a front pocket, a mandarin collar and hidden button closure and long, rolled sleeves, box pleat at the back. Slit front neck. model wears a size 36.